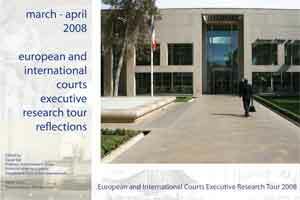 The second tour, in 2008, visited European and international courts in Strasbourg, Luxembourg and The Hague. The tour included an architectural design exercise in the Peace Palace where groups outlined their ideal courtroom configurations for hearings involving alleged war crimes, human rights violations and disputes between nations. A common theme of all the designs was an emphasis on placing justice spaces within a park or other natural setting. Access and openness – The various ways that the court buildings invite the visitor into spaces. Serenity and sanctuary – Ways some of the older and new courts provide serene spaces. Technology – How the courts avoid technological clut­ter while supporting modern methods of information access and communication. Information / way-finding – How signage, diagrams and legible spaces aid orientation within spaces. Security – Stress and waiting are addressed in design. Glass boxes for defendants send their own message. Sustainability – Reduced energy bills, a naturally lit environment, use of greenery and healthier spaces. Symbolism – The use (or avoidance) of overt symbolism including human imagery. Nature – Bringing nature into justice environments to calm and provide a healthier envi­ronment. 2. International justice settings: A court design exercise – Tour participants to bring together some of the lessons from the types of international or Eu­ropean courts they had just seen. 3. Segregation – The practical, symbolic and psychological effect of physically separating court spaces. 4. The European Court of Justice: A complex project management in an international environment. 5. New paradigms for court architecture. Avignon – Nouveau Palais de Justice, Avignon.